A traffic impact study is generally required when a site has been approved for development and long term activity is likely to either affect existing levels of traffic flow or result in traffic diversions along alternative routes. Not only must there be sufficient access points for vehicles working or parking onsite, but the system must continue to allow for satisfactory usage and safety for regular road users. Traffic and parking surveys provide developers and planners with the information they need to make informed decisions about alterations to existing road systems that facilitate as smooth a usage of the roads as possible. Traffic surveys using pneumatic tube vehicle classification / speed count road side units. 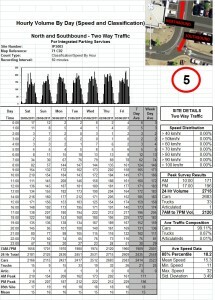 Intersection traffic surveys where there may be multiple ingress / egress points to a parking facility. Parking demand and duration surveys by time of day / day of week. These surveys are particularly useful to determine parking utilisation versus parking capacity. Based on the analysis and interpretation of survey data, traffic and parking assessment reports can be provided, together with recommendations to address issues that can adversely impact on vehicular access and traffic flow that affect the operational efficiency of parking facilities. To enquire further about these surveys Contact Integrated Parking Services on 0438 524 161.